We spoke to David Blayney Brown, co-curator of the new exhibition at Tate Britain, which is the first comprehensive show devoted to the late works of Turner. It is a celebration of the last 16 years of Turner’s life when he had a tremendous creative renaissance and produced some his most exciting and innovative work. It is loved today but not always understood – for example, assumptions tend to be made that Turner was a proto-abstract or impressionist painter, but these often arise from studio or unfinished work that he never expected people to see, let alone form critical judgements about. Turner’s exhibited late work was controversial at the time because it pushed boundaries. But that does not mean it is just about technical virtuosity. It is rich in meaning, allusion, cultural and historical reference – all the things that had always interested him, combined and expressed with vivid imagination and extraordinary technical bravura. It is actually the first comprehensive show devoted to Late Turner, and coincidentally it is happening in the same year as exhibitions of Late Rembrandt and the late Matisse cut-outs. Not really planned, but interesting! As far as Turner is concerned, we are showing the late work in all its aspects – landscape, history, myth, modern life, the machine age of steamers and trains. We hope there will be a sense of transition but also synthesis in the work shown. We call it ‘Painting Set Free’ both to acknowledge Turner’s technical liberation in the late work, and because we want the show itself to be an act of liberation, releasing Turner from reductive critical stereotypes – whether applied in his lifetime or since. I am only one of three and we are a team. But I have always loved Turner’s work (who doesn’t love the late watercolours?) and have worked with Tate’s Turner Collection for more than 25 years. That is hard to choose as one hopes there will be many. But I think it will be wonderful to see pictures that Turner intended as pairs together again, like Tate’s Ancient Rome (1839) and the Getty Museum’s Modern Rome (1839); a big gallery of spectacular historical subjects, ancient and modern; a small room of square or round pictures of extraordinarily imaginative subjects that will glow in the dark and take us deep into Turner’s psyche; and rarely seen works like a watercolour of Bamburgh Castle that has only appeared once in public for more than a century. Even harder to choose. But the most exciting thing for me is not my discovery at all but a colleague’s; some watercolours that we used to think depicted a fire at the Houses of Parliament in 1833, but actually show one at the Tower of London in 1841. So luckily we can include them. Trying not to overspend. Budgets rule. We are using Tate Britain ‘s Linbury Galleries which are good, classic spaces. As we are covering a period in depth, we are not doing so strictly chronologically, but thematically. That said, the first room is by way of an overview and retrospect, so visitors will see Turner’s death mask before they come to most of his work; and his last exhibits in 1850 will be on the last wall in the final room, which seems fitting. The only significant installation challenge is integrating watercolours and oils, which have to be zoned to allow for different light levels. There are always some but I would never say which – all exhibitions are the art of the possible. In fact I am thrilled and astonished at how many wonderful things we have been able to borrow (I have mentioned some already), thanks to lenders, public and private, who have recognised the value of the show and supported it. 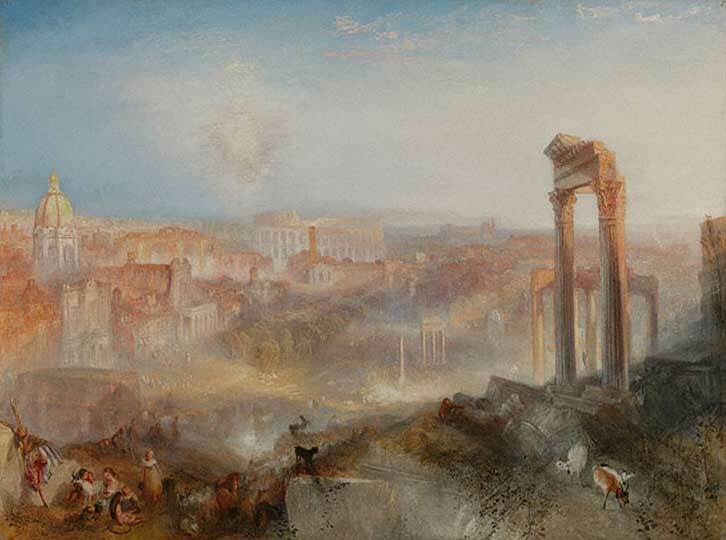 ‘The EY Exhibition: Late Turner – Painting Set Free’ is at Tate Britain from 10 September 2014–25 January 2015. Which 10 young people working in the art business should go on the Apollo 40 Under 40?